That the figure of George Castriota, known as Scanderbeg (1405-1468), is of major importance for the identity of the Albanians is seen in the fierce controversy that arose over the publication of a new biography on Scanderbeg by Swiss historian Oliver Jens Schmitt (b. 1973), professor at the University of Vienna. After much research in northern Italian archives, Schmitt was able to paint what he regards as a more accurate picture of Scanderbeg, analyzing him as an historical figure rather than presenting him as the traditional, larger-than-life national hero. 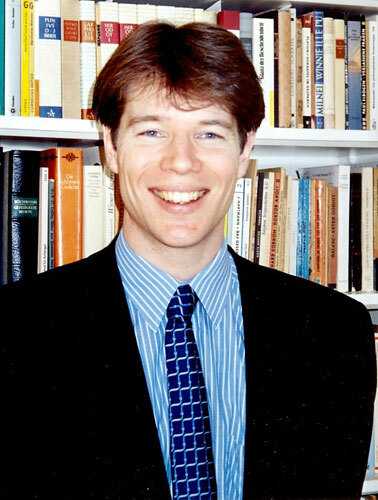 Schmitt’s discoveries shocked the Albanians, almost rocking the foundations of the Albanian state, and the debate that arose in the autumn of 2008, involved passionate arguments and counter-arguments in the media, the public, and even in the Albanian government. The concluding chapter of the book, presented here, contains a synthesis of Schmitt’s interpretation of the life of Scanderbeg, a tragic figure of his age. The history of Scanderbeg revolved around a twenty-five-year-long uprising, a complex muddle of battles and obscure diplomatic struggles that are difficult to interpret. Castriota’s rise constituted, without a doubt, the greatest challenge to the Ottoman subjections of the Balkans. Yet, a mere account of the historical events is insufficient. One must endeavour to provide an interpretation that places the uprising in a broader context and elucidates what was behind it. The historical events themselves can be seen at two levels: the anatomy of the uprising, an interpretation of the revolt against the sultan, and the figure of Scanderbeg himself. It is the memory of him that has survived the centuries. He was revered in the Balkans and in the West long after his death. The uprising and its leader are inseparable. To understand the momentous events that took place in the mountains and forests of the Western Balkans, one must ask who the people were who rose to challenge the might of the sultan and what drove them to act. One must also remember that many chose not to support the uprising. With this in mind, it becomes evident that what separated the rebels from the followers of the sultan was not a clear-cut geographical, social or linguistic division. The uprising in the region between the Adriatic and the slopes of the Polog Mountains created a clear rift between the supporters and opponents of the new imperial order in the Balkans, between town and countryside. The urban centres of the north were under Venetian rule. Not only did they refuse to support Scanderbeg, they opposed him in battle on numerous occasions. Castriota did not succeed in wrenching these groups from Venice, not even by waging war on them. He also failed in the southern regions under the control of the Ottomans. Berat, Vlora and Gjirokastra remained outside of his sphere of influence. The townspeople and the country folk spoke the same language, but this was of no importance. No one behind town walls moved a finger to help the rebels. Indeed, the rebels were defeated and repulsed in Berat. In the east, too, the gates of the mighty towns of Ohrid and Skopje remained shut. The townspeople were looking after their own interests: free trade routes, fields and pastureland that they wanted to keep from the clutches of rebellious nobles and their followers. Scanderbeg led his mountain forces and the herdsmen into the valleys to rob and plunder there. It was the highlands vs. the lowlands, and the mountain people pillaged whatever they could not find in their meagre alpine abode. This was hardly conducive to getting the townspeople to support Scanderbeg. The Ottomans and the Venice held onto their fortresses because they provided the townspeople with protection. Scanderbeg was left with the countryside and a few minor castles. But even here, he was unable to win over the population to any substantial extent. The townspeople refused to be ruled by noblemen from up-country; they preferred the orderly administration of the Venetians and the Ottomans, as did many farmers. In the lowlands, Venice and the Ottomans had built up a class of village leaders and spahees, men who would have had much to lose if the nobles from the mountains had taken power: Scutarine patricians and village elders thus fought the rebels as did the privileged Orthodox villages of western Macedonia and southern Albania, and the well-paid Muslim and Orthodox timariots. Even in the highlands, many men refused to support the rebels. The mountains of Dukagjin successfully resisted and held out against Scanderbeg’s attempts to conquer them. This can be explained in good measure by the social, economic and cultural differences between the highlands and the lowlands, but further explanation is needed because Scanderbeg never even received the support of all the highlands or of all the country people. All that the rebels had was a rather small strip of territory, devoid of major settlements, around Kruja, in the Mat Valley and Dibra, and in northern central Albania, the hinterland of Durrës and along the Shkumbin River. This region, opening southwards, consisted of areas under the control of the Araniti, Balšić, Thopia and Castriota families. It was almost continuously under attack from the Ottomans who brought about the downfall or military destruction of these families. With regard to the social structure of the rebel movement, one can see a clear split running right through Albanian territory. Much of the Ottoman elite consisted of Albanians who had converted to Islam, be they scions of old families such as the Muzaki, Zenebish and Dukagjin, or social climbers who were grateful to the sultan for their privileges. The military commanders, leaders and simple soldiers, i.e. the whole army fighting against Scanderbeg, consisted of local Albanians, Bulgarians, Serbs and Vlachs. There were also Turkish Muslims in the Ottoman forces who owned timar lands. On the whole, it is evident that the rebels were not opposed by “foreign” invaders, but by local forces loyal to the new empire who were willing to fight members of their own ethnic groups longing for pre-Ottoman times. Many Albanians had good reason not to join the uprising. The movement was not fostered by language or any feeling of belonging to an ethnic group. Religion was somewhat more of an element of division, but one must be cautious here, too. There is no doubt that the rebels were Christians, but their exact religious affiliation, whether Orthodox of Catholic, is less clear. Both affiliations were present in Albania, and often in the same regions. Loyalty to Rome came later and reached its zenith after 1460. The allegiance of the rebels to Christianity was a sign of their solidarity to one another and of their opposition to the empire. The uprising was fostered primarily by converts who made their fallout with the sultan known by proclaiming their return to the Christian faith. All the rebels were Christians or renegades who embraced their original faith publicly. There were no Muslims among them. Yet, the uprising did not affect large sections of the Christian population on Albanian territory. The Catholics in Venetian Albania and many Orthodox subjects in the south or in western Macedonia kept their distance. Some Christian officials maintained their loyalty to the sultan. Christian timariots, Christians tasked with guarding mountains passes, and many auxiliary Christian troops took part in quelling the uprising. Of course, the main body of Ottoman forces were Muslims, but there was no religious conformity on the Ottoman side. Scanderbeg’s uprising may be called Christian because it was supported by the Christians, but it was not because it was in itself a general uprising of the Christians. In fact, it is difficult to assess the religious component of the uprising. It may be taken for granted that many people at the time thought in categories of Christian vs. Muslim, but it is not clear what exactly they meant. Was a Muslim primarily a supporter of the sultan and expressed this support of religion to show that he belonged to the new imperial elite? Or were the rebels fighting not only the supporters of the sultan, but their religion in general? Things seemed clear in the West. Papal rhetoric and the political language used by the Catholic powers in the Adriatic celebrated Scanderbeg as the “Athleta Christi” and defender of the faith. It would be too simplistic, from our modern agnostic perspective, to view Scanderbeg’s actions simply as a struggle for power and to deny him any element of religious sentiment, just as it would be to regard his uprising as a holy war. Sources near to Scanderbeg show that the rebel leader thought in religious categories by dividing his friends and foes into “Christians” and “foes of Christianity.” Among the latter he included Christians such as his rival Leka Dukagjin. It is also known that in the last decade of his life, Scanderbeg used Christian rhetoric that he had learned from his spiritual advisors. But here again, it would be too simplistic to regard Scanderbeg’s allegiance to Christianity as an exertion of influence on the part of Albanian Catholic priests. Scanderbeg evinced strong political will and was no doubt able to set the pace and direction of his activities himself. He had a good relationship with some of the popes, Calixtus II and Pius II, indeed a very close relationship to the latter. Even though this changed under the pontificate of Paul II who was less interested in Albania, Scanderbeg’s ties with the Catholic Church in Albania remained exceptionally important. By 1450, at the latest, the Catholic Church in northern and central Albania was the only institution supporting the uprising. As opposed to the other allies and supporters of the rebellion, it was not sapped by treachery. Scanderbeg did not have a stable or socially cohesive community of followers. One must firstly distinguish between the nobles among his allies, who joined him in a military alliance against the Ottomans in the spring of 1444, and those who followed him for reasons of personal loyalty, i.e. his actual supporters. The nobles did not regard the alliance as a means of creating an expansive State in the southeastern Adriatic. They were more interested in restoring the largely anarchic conditions that had been prevalent between the fall of Serb rule over Albanian territory (in the 1370s) and the consolidation of Ottoman control (which became definitive around 1430). They refused to pay the new imperial taxes, to recognize the new laws and to submit to its supremacy. They understood “freedom” as the right to rule over groups of supporters and minor, local rulers who had escaped from all imperial authorities at the end of the 14th century. Yet, they themselves had no policies as a new alternative to Ottoman rule. Their objective with this alliance was to pursue their petty feuds, in particular against those living in the towns of Scutari and Drivasto under Venetian rule. Few of these leaders had much support of their own, and, what is most notable, they were never willing to subordinate themselves to Scanderbeg, to whom they had pledged allegiance in 1444. As far as can be seen from the source material, none of these leaders ever gave up command over their own men. It is to be noted that the followers had pledged allegiance to their direct masters who had pledged, for their part, to care for them, and not to Scanderbeg who was the commander of rival forces. At best, the nobles co-operated with one another, but it remains uncertain whether Scanderbeg was actually their primus inter pares or was just one leader among several. The alliance of nobles used up most of its energy in feuds with Venice and the towns of northern Albania, wars that it waged in conjunction with the Serb despot and the leader of Montenegro on behalf of the Kingdom of Naples. This alliance collapsed during the attack of the sultan in 1450. Only the core of the alliance under Scanderbeg and Araniti Comino fought on. The weaker leaders preferred to trim their sails to the wind according to prevalent power structures at the time in question. When the sultan was in the country, they gave him their support. When he withdrew, their quickly reconsidered their position and joined Scanderbeg. Since the nobles also possessed a good portion of the little farmland and pastures in the lowlands, their interests were contrary to those of Scanderbeg. Castriota was dependent on the export of grain and salt to pay his troops and to buy arms. He thus did not hesitate to suppress anyone harshly who refused to submit to him and to provide troops and land to the uprising. It is no wonder that many nobles looked for support from foreign powers. The Ottoman Empire, Venice and Naples willingly took in any leaders whom Scanderbeg had insulted or oppressed. They all deserted him at one time or another. 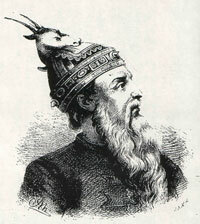 His father-in-law, Araniti Comino, and his relative Stefan Crnojević ended their days as Venetian captains. The Balšić were expelled and deported to Italy. Castriota got his hands on the territory of the Thopias, whose supporters were defeated near Berat in 1455. The Muzakis, whose land was close to the Ottoman border, fell into decline. Moses of Dibra was elevated by the Ottomans for a certain period as an alternative ruler. Only the Dukagjins manage to evade the force of Scanderbeg’s rule. What began as a rising of nobles ended as a solitary struggle on the part of Scanderbeg. A wedge was driven not only between the nobles, who were never particularly united anyway, but also, and even more so between members of Scanderbeg’s own family. He could only rely to a limited extent on his relatives, even though blood ties had always been very important in western Balkan society. His brothers had either died before the start of the revolt or played very minor roles. His brother-in-law gave him only very modest support. His nephews had difficult relations with their overpowering uncle. Some of them died for him, but others, whose fathers had, like the Thopias, been unfairly treated by Scanderbeg or who, like Hamza Castriota, hoped to succeed him, not only refused to submit to him, but defected repeatedly to the Ottomans. It is no coincidence that Repoš Thopia, son of the Muzaki who fell in 1455, whose land had been seized by Scanderbeg, took advantage of Ottoman support to get his uncle’s land back when the latter died. Nor is it a coincidence that Hamza Castriota, the most dangerous leader among those who defected to the Ottomans, had been one of Scanderbeg’s original supporters. Among the nobles, Scanderbeg received most of his support from younger men whose families had declined substantially in power or who were being directly threatened by the Ottomans. But these were usually village leaders, most of whom were Orthodox priests from the mountainous regions of Tumenisht (around Kruja), Mat and Dibra. Their supporters consisted of farmers and shepherds who were wont to descend from the harsh highlands to pillage in the fertile lowlands, something that they continued to do right into the early twentieth century. Many of these men had felt loyalty towards Scanderbeg’s father and continued to accord it to his son, whose martial deeds in the Ottoman army they respected and whose desire for revenge they shared. The existent source material does not allow us to define the core of Scanderbeg’s support with any great accuracy. It is, however, apparent that social structures were involved which have been typical for the highlands of the Balkans until quite recently: a rural society, no urban population, living in a heavily forested and inaccessible mountain region. The people in the lowlands lived off farming and orchards whereas those in the highlands depended on herding (mostly sheep) for their livelihood. Up until the twentieth century, the population of the Balkans was still largely composed of semi-nomads, who lived in the highland pastures in the summer and descended to the lowlands with their herds in the winter. These herdsmen had no objections to moving around. They were frugal, tenacious and knew the geography of the region intimately. Since the highland regions could not support many troops, Scanderbeg’s supporters usually consisted of two to three thousand men, often less than that. Scanderbeg recompensed his mobile forces with booty, with funds deriving from trading activities and with money from Italy sent to assist him. He also ensured that their families were protected and provided for. It was not a rigidly structured feudal system but rather one based on loyalty and close personal ties. The men supported their leader and literally saved his life. In the innermost circle of support were some chancellors, Dalmatian merchants, and members of the Catholic clergy in central and northern Albania - abbots, monks, bishops and archbishops. It is because of them that Scanderbeg became a well-known figure in the West and not just another rebel in the distant mountains of the Balkans. These men approached foreign rulers and councils, procured funds and purchased weapons. Ethnically, they were a mixed group: Albanian clergymen, Ragusan patricians and Slavic Dalmatian intermediaries, the latter often having business interests in Scanderbeg’s realm. This core of men may have been few in number and their positions and status may have been modest, yet they acted with great talent and flexibility and thus managed to avoid Ottoman attacks better than the chancellors and courts of the Orthodox realms of the Balkans. Scanderbeg’s uprising was not a one-dimensional struggle against the Ottomans. He was almost always fighting on several fronts at the same time. He was continuously involved in feuds with his Christian neighbours. He and his nobles conducted disputes with towns in northern Albania over fields and pasturelands. Scanderbeg struggled fiercely with the Dukagjin clan. If we include all the infighting within the Castriota dynasty, we realise that the Christian Albanians in the region were almost constantly at his throat. Seen from another perspective, one could say that Scanderbeg was drawn into a power struggle between Venice and Naples over rule in the Adriatic. For centuries, the Albanian coast had been the theatre of such struggles for hegemony. Castriota was unable to extract himself from the demands of regional geopolitics. He had originally turned to Naples for support and in 1451 had sworn an oath of allegiance. This provided him with protection and support from King Alfonso V, but it made his forces party to the war against the Republic of San Marco. Like his feudal liege, he fought on two fronts, against the Ottomans and against the Signoria. His realm was no more than a link in a broadly spanned chain of Neapolitan vassals in the Balkans against which Venice had spun a net of regional princes in its pay. As such, the Balkans were the theatre of inner-Italian warfare to which Scanderbeg would eventually fall victim and perish. Castriota’s star declined definitively in 1467 when the Venetians expelled the Neapolitans from central Albania. His hostility towards Venice, influenced at least by Naples, was the reason for his downfall. However, it was not the Serenissima but the Ottomans who finally defeated Scanderbeg after decades of battle. Castriota was confronted not with the sultan himself, but with his mighty commanders in the Vardar Valley and Thessaly, men who stemmed from Ottoman military dynasties, were extremely wealthy and had substantial military forces at their command. These were talented figures, equal in every respect to Scanderbeg who before 1443 had been his ally in their common endeavours under the sultan. These old veterans of the sultan’s army knew one another well before they extended the war throughout the western Balkans. Scanderbeg drew one advantage from the fact that the sultan’s main forces were engaged for years on end in other conflicts. The task of putting down unrest in the mountains of the west was given to subordinate leaders. Whenever the sultan intervened personally, his mere presence at the head of vastly superior forces was sufficient to put the rebels under enormous pressure. Murad II’s attack on Kruja in 1450 was repulsed, but it brought Scanderbeg to the verge of annihilation. When the sultan finally decided to defeat the rebels by all means, he succeeded in doing so, even though it involved a huge bloodbath, massive destruction and a virtual depopulation of enemy territory. Though Mehmed II’s campaigns in the northern Balkans and Asia Minor contributed substantially to keeping the flame of revolt alive much longer, Scanderbeg did not stand a chance against the armies of the sultan in 1466 and 1467 when thrown back to his own power base. Castriota was well aware of this from the start of the uprising and devised his plans accordingly. He never envisaged himself at the head of a vassal kingdom at the edge of the Ottoman Empire. It was all or nothing for him from the beginning. His goal was the destruction of the Ottoman Empire pure and simple, a massive attack from all sides. He thrice endeavoured to realize this ambitious objective with his allies. And the prospects of success were not that small. In 1443, Ibrahim of Karaman advanced from the east, John Hunyadi and George Branković from the north, and Burgundian and Venetian ships approached from the west. In the Balkans, Christians rose in Albanian territory, in the Pindus Mountains, on the Peloponnese, and in Serbia and Bulgaria, but the venture failed due to over-extended lines of communication that impeded detailed planning. However, the Ottoman Empire was struggling for its very survival. A decisive role was played by the Balkan leaders who had turned Turk, but who at the decisive moment sapped Ottoman resistance in the Morava Valley by deserting. Five years later, surprisingly soon after the massive defeat of the Hungarians near Varna (November 1444), the strategy was attempted once again. John Hunyadi attacked anew from the north and Scanderbeg from the west, though too late. Savage battles were fought once more and the very survival of the Ottoman Empire was in question. A third attempt was undertaken in 1463 and 1464 by Pope Pius II, Venice and Matthias Corvinus. The death of the pope and the western policies of the young king of Hungary impeded its success. All three offensives were characterized by the same alliance: Scanderbeg’s friendship with the house of Hunyadi, personified by the Hungarian vice-regent John Hunyadi, an unrelenting foe of the Ottomans, and then by his son Matthias Corvinus. This shows that Scanderbeg did not rely on the Italians, but on the largest Christian army in southeastern Europe: the Hungarian Panzerreiter (knights). These well-armed troops who forced their way down the Morava Valley looked more likely to bring victory than the frightened Italian condottieri. John Hunyadi and Scanderbeg no doubt first met during Scanderbeg’s attack on Transylvania when he was in pursuit of the Ottoman army in the early 1440s. The two of them were resolved not only to defeat the Ottomans, but to destroy them entirely. Both were charismatic military leaders and no doubt respected one another. Scanderbeg relied on the Hungarians for two decades. When Matthias Corvinus turned westwards to his feud with the Emperor Friedrich III after his defeat in Bosnia (1464), the pressure exerted on the Ottomans at the Danube was relieved. Their advance towards the Adriatic was now unimpeded. Scanderbeg thus paid the price for the Austrian and Bohemian adventures of Corvinus. The Kingdom of Hungary was, however, not the only southeastern European neighbour upon whom Castriota relied. His uprising was at least as interconnected with the rulers of his Byzantine and southern Slavic neighbours. The Orthodox aristocracy in the Balkans was so closely interrelated by marriage that it can be viewed as one group, united by its Byzantine heritage and Orthodox beliefs. Ethnic origin was of little significance when Greeks, southern Slavs and Albanians allied themselves with one another in marriage. But there was a deep cleft in this elite, too. Most of the old families were divided into pro-Ottoman and anti-Ottoman factions, although this did not mean that relations between the two sides were necessarily severed. As a result of the Ottoman advance, there was little unity among the ruling class in the Balkans. The only assistance they could hope for against the rising Empire was from the Catholic West, but most of the Orthodox princes rejected this out of deeply held religious convictions. In Serbia and Herzegovina where the heretical Bosnian Church still had some influence, many tried to position themselves between the sultan and the Catholic princes of the West, and to play the great powers off against one another. This required considerable diplomatic skill, manoeuvrability and flexibility because pressure was increasing from East and West every year for them to take a clear stance. The Castriotas were not old aristocracy. However, the impulsive Ivan and his famous son George soon achieved renown and this served them well to build up a broad network of marriage alliances with more important Albanian dynasties. Relations had always been close to the Serb princely dynasty of the Brankovići. Blood ties seem to have existed since the time of Scanderbeg’s father. The younger generation of the Castriotas certainly had ties: Scanderbeg’s son Ivan married Irene Branković whose mother was a Byzantine princess of imperial lineage. The two families, i.e. the famous old Brankovići and the young and dynamic Castriotas gave support to one another. 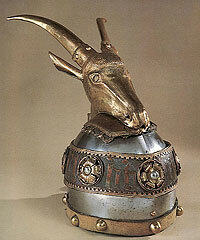 The Castriotas gave shelter to the Brankovići when they were on the run and reinforced their mutual ties by marriage. This, however, does not mean that the two families held the same political convictions. George Branković regarded himself as an Orthodox prince and therefore accepted the sultan’s offer to reign as an Ottoman vassal. Scanderbeg, who was originally an Orthodox Christian, too, rejected vassal status and, as opposed to the Serb dynasties, turned to Catholic Europe. He was the sole Orthodox ruler in the Balkans to ally himself consequently with the West. Elsewhere, in Serbia, Byzantium and the Peloponnese, the Catholic Church and the “Latins” were rejected. Scanderbeg’s western orientation is thus something of great significance. It removed him from Balkan Orthodoxy and made him presentable as a potential ally in European courts. The political change of course brought about a change of religious affiliation, too. The Orthodox Christian became a Catholic Christian, something quite unusual at the time. This alignment with the West did not mean that Scanderbeg had cut off ties with his Orthodox neighbours. All the rules of Albania were Orthodox, as were the Crnojevići in Montenegro, and his Greek relatives (the Ralles and the Palaeologi) in the Peloponnese. All of the southeastern Adriatic was either related or had political ties with Scanderbeg. Castriota also enjoyed much prestige in the interior of the peninsula. Though we do not have an accurate picture of the situation due to a lack of archival material, the rulers of Bosnia and Herzegovina had not only heard of the theatres of war conducted by Scanderbeg, they also exchanged emissaries with him and maintained trade ties, and requested his assistance in the year 1463. The most powerful men of the mediaeval Balkans, the king of Bosnia, Stefan Vukčić from Herzegovina, and the Serb despot George Branković, regarded Scanderbeg as their equal, an honour accorded otherwise only to the venerable Araniti Comino. However, these men never actually managed to help one another. There were natural divides between them that hindered the flow of information and impeded the exchange of warriors between the southern Slavic and Albanian parts of the Balkans. What is more, the Bosnians, Herzegovinians and Serbs were always under threat themselves, caught up in domestic quarrels and therefore not in a position to go on the attack. There is, however, little doubt that there was a sense of common concern and mutual support among them. This is evinced by the transfer of Serb funds, by Albanian grain shipments, and Bosnian calls for assistance. Scanderbeg looked increasingly towards the West for support in the Adriatic. His rule was propped up by his close ties with the feudal lords of southern Italy, by his military alliance with the house of Hunyadi to the north and by his connections with his southern Slavic neighbours, support he could not rely upon among the nobles of Albania itself. With the assistance of Alphonso V, Castriota appealed to the West, though not to the German Empire and northern Europe. Smaller states such as Siena were not able to assist him. Even the larger ones such as Milan were under threat. Yet, the echo of his cry for help was heard from the Balkans. Even in distant Burgundy, preparations for crusades made twice, though of course not simply because of Scanderbeg. These were crusades in which he was an ally. Of all the Western powers, it was the pope who provided the most support to the Christian rebels in Albania. Scanderbeg was one of the most important allies of Calixtus III and Pius II who both initiated attacks on the Ottomans and whose planned attacks were to be focussed on the Albanian coastline. Calixtus III celebrated Scanderbeg as a shining example for Western princes, as a true Athleta Christi. He and his successor, Pius II, thus laid the foundations for Scanderbeg’s reputation as a heroic defender of the faith, renown that lasted in Europe for centuries. This was not simply rhetoric for the crusades. The popes meant it seriously. This renown lavished upon him by the popes, provided him with concrete political advantages. The alliance with the Holy See allowed him to extricate himself from his dependency on Naples, a determined foe of Venice. The offer of Pius II to crown Scanderbeg as king was particularly enticing because the Holy See, as a third power in Italy, disrupted the stalemate between Venice and Naples over the eastern bank of the Adriatic. The creation of a Catholic kingdom of “Epirotes and Macedonians” as it was to be formulated in the age of Humanism, was not as unlikely as one might have imagined. Since the high Middle Ages, the popes had been crowning or offering to crown the rulers of southeastern Europe. For him to accept the proposal would simple have been to follow the tradition set by major Serbian and Bulgarian rulers and thus gain tremendous legitimacy for his new and unconsolidated reign. That this project, linked to Scanderbeg’s attack on the sultan, failed, became his undoing. He had reached for the stars, put all his cards on the table, and lost everything. Scanderbeg’s political strategy of attack wherever possible and of avoiding defence arose from his experience in earlier uprisings and the training he received in the Ottoman army. Indeed, all of his offensives failed: 1444, 1448 and 1464. It was impossible to coordinate an attack among allies from all over Europe and Asia Minor to work at the same time. The Ottomans always had the advantage of being on the inner side of the front and thus had shorter communications lines to bridge. Yet, as opposed to many schemes devised at Western courts, these attacks actually took place. Scanderbeg and his lightly armed troops were certainly never the keystone of a comprehensive strategy, but he was an important link between the Italy and the Balkans. Castriota could never defeat the sultan, but he was in a position to cause him great harm. The end of the struggle confirmed that the strategy of attack was the right one. Scanderbeg was not able to overcome the might of the sultan’s main forces. The great Christian rebellion would never have taken place without Scanderbeg, and would never have lasted twenty-five years. The uprising is hard to understand without comprehending the basic personal, biographical dimensions involved. The sources for this do not permit us to go into any depth here. Scanderbeg’s deeds can be more or less reconstructed, but his motives and plans are not well understood. They can only be deduced from his actions. From the existing information, we must endeavour to paint the portrait of a man who lived in a variety of cultures at a defining moment. His world was multilingual and one comprising a whole gamut of beliefs from the two great religions, Christianity and Islam. Knowing several languages was nothing unusual for the ruling classes in the Balkans, but few leaders knew as many languages as the much-travelled Scanderbeg. What distinguishes him even more from other rulers was that he changed his religion at will. Many young Orthodox nobles had converted to Islam, but none had returned to the religion of their ancestors. Scanderbeg did not just become a Muslim. He did so among the dervishes who had often had tense relations with the Sunni community of the sultan. Raised as an Orthodox Christian and converted by the dervishes, he would no doubt have presented himself as a Sunni Muslim. In 1443, he publicly returned to Christianity. It is unclear whether he returned to his original Orthodox beliefs as one would expect, or whether he was already taking steps towards Catholicism. In the early years of the uprising, he used Orthodox symbols such as the double-headed eagle, and his turn towards the Church of Rome only occurred when he lost important reaches of his territory in the east, and, in particular after 1450, when he was in desperate need of support from the Catholic clergy, both in Albania and in Rome. His status as a vassal of Naples also brought him closer to the Catholic world. Scanderbeg thus turned openly to the West, as opposed to all the other rulers of the Balkans. This political dimension of religion is evident in the source material since his profession of faith was understood as a political statement. It is, however, much more difficult to say anything about Scanderbeg’s personal religious beliefs. The few letters and documents we possess from his chancellery prove that he regarded himself as a Christian ruler. The profession of faith can only be seen in his acceptance of a common war with the pope in 1463. It can only be speculated as to what extent the years of dissimulation at the Ottoman court and the various changes of religion left marks on his soul. Little attention is paid to religion in the few reports from the men who actually knew him, but other characteristics are stressed: his sense of loyalty, in particular to the house of Aragon, a sort of feudal relationship since it continues after the death of the feudal lord and is transferred to his son without a new oath of allegiance; an undeniable sense of pride and honour in his dealings with the sultan and with the Adriatic powers, personal courage, cunning and skill (e.g. the ambushes in the Apulian War), and clear strategic thinking as evinced in the notes from his discussions with the diplomatic representatives of Milan. Contemporaries regarded Scanderbeg as an unusual figure because he fulfilled some expectations, e.g. ideals of Balkan heroism, but did not fulfil others. Italian rulers were quite puzzled by his arms supplies to Ferrante because the principle of unconditional loyalty was unimportant to them, in particular when it involved great personal sacrifice. Castriota appears in the source material both as a Balkan nobleman and as a figure of the Renaissance. Essentially, he was the product of the interior of the Balkans, a man from a society that had definite views on what a leader ought to be and where oral songs celebrated heroic warriors. Scanderbeg can be seen as a protagonist of the “heroic lifestyle” (Gerhard Gesemann) that survived until very recently, something quite foreign to the post-WWII western reader. The term “heroic” when dealing with Scanderbeg must therefore be seen within the context of southeast European traditions. Castriota’s fame among many peoples in the peninsula derives from the fact that he incarnates the heroic ideals of the Balkan highlanders, as seen in Albanian and Serbian folksongs. Contemporary sources prove that as an historical figure Scanderbeg accorded with this image. His deeds on the battlefield were what brought him glory among friends and foes. He rejected the lifestyle of southeastern European monarchs who preferred to live in palaces, surrounded by courtiers, secretaries and scholars. He was more of a highlander, a warrior by nature who was particularly resilient. He was forty years old at the start of the uprisings, almost an old man at that period. When he was in his fifties he took part with his men in the Battle of Berat and fought his way out of it, as a Venetian patrician tells us. When he was almost sixty, he captured an Italian nobleman and heaved the fellow all by himself onto his horse, to the horror and amazement of the other Italians present. He was sixty-two in 1467 when he relieved Kruja. Rare were leaders of his age group in Europe who were still in the vanguard of battle. Scanderbeg proved his skills not only in the use of arms, but as a commander. He had gathered much experience in the service of the Ottoman army, in Anatolia, in the Balkans and in Transylvania. He keenly observed the military strategies of the Ottomans and their opponents, and had seen the Janissaries, the Hussite war wagons, and Anatolian horsemen in action. A detailed knowledge of his foe, and the mentality of those supporting the other side, as well as familiarity with the topography, enabled him to adapt his military strategy to his needs. His fighters, lacking armour and equipped with only light weapons, were no match in pitched battle for the armed cavalry and the Janissaries of the Ottomans, but they sufficed to terrify the Turks groping their way through Balkan gorges where his men lay in ambush, appeared from out of the forests with lightning speed or attacked from the cliffs or during the night, only to retreat into the dark forests again. Scanderbeg became the epitome of the Balkan guerrilla fighter whose closest allies were the forests and mountains. His charisma captivated and mobilised supporters from the highlands again and again. He and his men avoided open battle on flatland and around fortifications. They were not equipped for this, and they had learned from experience in Kruja in 1450 just how perilous it was to be surrounded in one spot by superior forces. The Ottomans, for their part, were full of admiration for Scanderbeg as a model warrior. It was they who had given him the title Iskender Bey. But their admiration soon turned to trepidation when they tried to advance through the wooded gorges of Dibra. Magic powers were attributed to Scanderbeg, even after his death. His bones were considered talismans and were believed to provide support and protection in battle. The trepidation that Ottoman soldiers felt in the dark forests and mountains was certainly heightened by their vision of Scanderbeg as a rebel leader with wondrous powers. Italian observers would not have understood the Balkan side of Scanderberg; their vision of him as a hero was quite different. It was marked by the Crusades and humanistic ideals of the age. They viewed Scanderbeg as the Athleta Christi and the new Alexander the Great. Papal rhetoric and official correspondence, infused with the ideals of humanism, celebrated him while he was still a little known figure in the distant mountains of the Balkans, before he had reached fame. When Castriota visited Italy, which he did on numerous occasions, he was accepted as part of the political world of the Renaissance, though an exotic figure, a warrior who not only gave commands but who stood in the frontline of battle himself, a cruel fighter who preferred to kill rather than to negotiate, the leader of a nebulous mass of supporters from a foreign world in which war was not art but a savage struggle for survival. 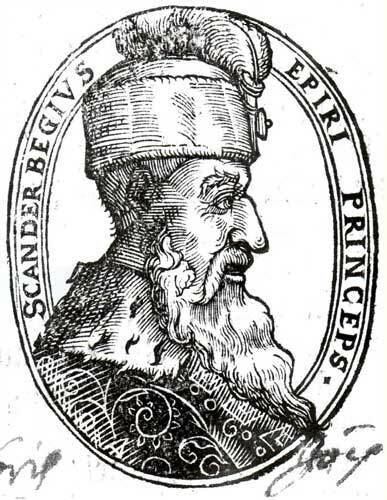 Scanderbeg appeared not only as a foe of the Turks, but intervened briefly in Italian affairs. This brought him praise and adulation from his allies of the period, but did not protect him from the mechanics of Italian power politics. The virtues which his royal and princely eulogists celebrated - unselfishness, self-sacrificing loyalty – were soon to be to his detriment. He was regarded as exotic not only for his martial deeds, but also for his manner of thinking that proved to be his downfall in a new age. What distinguished Scanderbeg from all the other Balkan leaders was his unconditional will to fight. As opposed to his neighbours, he not only strove to ensure his political survival by manoeuvring between the great powers, but was also determined to bring an end of Ottoman rule in Europe. His motive was unflinching and personal: revenge for the death of his father. This motive is of decisive significance. It serves to explain his tenacity, his absolute refusal to compromise with the sultan, as other Balkan leaders had done. The uprising, which was soon to have an impact upon the whole of European history, was motivated initially neither by religion nor by politics. It was Castriota defending his sense of dignity that had been infringed upon, his honour in line with the values of Albanian customary law. He acted in accordance with tradition and the expectations of his society. The uprising was thus, though not exclusively a private quarrel with the Ottoman dynasty, a personal clash with the two sultans, Murad II and his son Mehmed II. The relationship between the foes will never be understood entirely because the motives of his conversion in 1443 remain in the dark. It was characterized by Castriota’s thirst for revenge, by the power-hungry young prince Mehmet, behind whom stood the enigmatic figure of Sultana Mara Branković, and by the murder of the Ottoman crown prince that led to a conspiracy among the power-hungry leaders of the Balkans at the time. This conspiracy turned into a fight to the death, interrupted only by periods of negotiations and brief ceasefires with no prospective of permanent settlement; a struggle that would inevitably end in victory or defeat. Scanderbeg prepared his uprising carefully since he was resolved to take this path to its bitter end. It was in the six years between the death of his father and the uprising, a period about which we know little, that the constellation of relationships crystallized that would mould the following quarter of a century. What is true of the highest echelon of a rebellion – an almost intimate relationship between the opponents – is reflected at lower levels, too. There was rivalry between the Balkan Christians - nobles and farmers who had converted to Islam. Hostility arose with Hizir Bey over who was to own the fortress of Kruja, a conflict that lasted over thirty years. Hizir Bey’s family fought the Castriotas for three generations and, in the end, they took possession of Castriota land. A second conflict arose between Scanderbeg and his father’s one-time follower, Balaban, whose family was also involved in the fight against Scanderbeg. Scanderbeg’s uprising was characterized by his profound personal disgust of the sultan and of the Albanians who supported him. He also fought against his compatriots who had converted to Islam, against Jakub Bey Muzaki, and against the governor of Tetovo from the house of Zenebish. Intimate ties and personal hostilities were always at play. He also opposed the governor of Skopje, Isa Bey, whose father had subjected Scanderbeg’s father. Here once again, the conflict between closely linked families carried on for generations. The same can be said of Scanderbeg’s earliest allies, John Hunyadi, probably George Branković, and later of neighbouring rulers in Montenegro, Herzegovina and Bosnia. On the Ottoman side there were Christian warriors who were related to one another or were at least from the same social class or region. The proximity made the fight so bitter. It tore families and closely-knit tribes apart. Many of the nobles who had converted to Islam had no reason to support Scanderbeg, and it is uncertain whether Scanderbeg would have risen in revolt had the sultan had not murdered his father. Notable are the regions that remained beyond the reach of Scanderbeg. These were first and foremost the urban centres with the above-mentioned patrician and village elite in the lowlands. Castriota was and remained a highlander. He loved the mountains and feared the sea. One strength of his character can be seen in the fact that he overcame his natural fear of the sea to sail over to Italy and to Dalmatia on several occasions. Scanderbeg intended to restore a vanished world by destroying the new empire that had taken over the Balkans. He regarded himself initially as a second Balša III. His thinking was thus regional and traditional, in particular in order not to scare off the other nobles. When they refused to support him, he changed his plans and strove to create a larger realm under Neapolitan suzerainty, hoping to create a kingdom of his own under the aegis of the pope. He took on the role of a new Alexander the Great, a Western hero fighting against the Orient, the founder of a new empire in the Balkans. His plans were lofty and his fall was profound. In the end, with his supporters all killed or dead, Scanderbeg stood alone, betrayed by many noblemen, even his close relatives, a victim of Italian power politics. When he died, he left behind a ravaged, depopulated land. Although we know much about the basic fabric of the population that rose in revolt, it is nonetheless difficult to determine what moved Scanderbeg and his supporters to rise. It is impossible to find one motive that united all those who took part in the revolt. The various groups involved were too diverse, and the war that lasted for over a quarter of a century had its own dynamics. Some elements would, however, seem apparent. There was Scanderbeg, the leader of the revolt, who was driven by a need for personal revenge. This did not make him blind; it drove him to participate in a broad conspiracy against the Ottoman Empire in which much of Balkan nobility was involved. He sapped the force of the Ottoman army by his desertion. For this conspiracy he needed allies in the Ottoman elite and support from the sultan’s dissatisfied subjects. He acquired both. There seems to have been substantial personal tension among the Balkan Christians who had recently converted to Islam, some of them remained loyal to the sultan, others did not. But Scanderbeg would not have survived long if he had only had the support of a few rebellious officers. There were the country people of Dibra, Mat and the Kruja region who took to arms to regain their “ancient freedoms” They rejected the Ottoman Empire and its new regulations, taxes and justice system. They tolerated no foreign judges among them and no interference in local affairs from a distant ruler. These isolated mountain regions opposed the new empire. Contemporary observers noted that the mountain people had a mentality of their own. The war offered them an opportunity to descend from their barren highlands to the fertile fields of the lowlands to pillage Ottoman and Venetian territories. Many noblemen from the southwestern Balkans had similar objectives. They had already lost much of their land to the Ottomans and now feared that they would be deposed by the sultan. They longed for the return of their “ancient freedoms,” and liberty to rule without a mighty emperor above them, without taxes and military service. There was also the Catholic Church that was intent on preserving a prosperous province and Catholic rites on the Balkan Peninsula, on defending ancient archdiocese, diocese and monasteries from the advance of the Muslim Ottomans. Many motives were involved that are difficult to distinguish from one another, in particular in view of the violent dynamics of war, betrayal, flight and repeated regroupings among the rebels. Adherence to the Christian faith acted as an identifying marker against the Muslim foe. But religion, though certainly a significant factor, was not the sole motor of the rebellion. The identity of the rebels influenced how they were perceived in the West, in particular when Scanderbeg was offered a role in papal plans for a major crusade. The struggle for freedom among the mountain inhabitants of the southwestern Balkans would not have survived without support from southern and western Europe. Yet, even with this support, provided time and again, the prospects of success were slim from the very start. The impoverished rural regions of Tumenisht, Mat and Dibra, devoid of urban centres, were in no position to bear the brunt of war. Scanderbeg’s life was no triumphant advance, but a long-term struggle for survival. It was marked by defeat, hopeless situations and yet many fortuitous twists of fate. Without the strong will of their leader, Scanderbeg’s exhausted supporters would have been defeated by the Ottomans at a very early stage. At the same time, it was Castriota’s unswerving will for victory that caused the fall of the highlanders. He asked too much of them by demanding that they accept and take part in his unconditional war against the Ottomans. The sultans showed no mercy with the rebels. Scanderbeg’s life and uprising thus turned into a tragedy for his native land that was devastated and depopulated as no other region of the Balkans before the arrival of the Ottomans. His abandonment in the final days of this life is symbolic. The warrior who was intent on avenging his father, the foe of two sultans, the Athleta Christi, the new Alexander the Great – stood alone in the ruins of his work. The world he knew had vanished. Gone were the popes and rulers who had promised him aid and assistance, his Christian neighbours in the Slavic and Greek-speaking parts of the Balkans, many of his allies in Albania, and in particular his small but loyal group of followers. Posterity ignores his tragedy and looks back on him as a hero who took up the torch in the struggle against the Ottoman Empire. In the minds of Christians in the Balkans, Castriota the Great lives on as a glorious hero. Everyone has forgotten that he was in reality the tragic figure of his age.